BRISTOL ROAD CLUB was founded in 1927 with the intention of forming a road racing club. A group of young enthusiasts had infiltrated the committee of the Bristol District Association of The Bicycle Touring Club, and started to organise all day runs. In a tea shop at the Hare & Hounds, Westonbirt, some members put forward a suggestion that invitations be sent to C.T.C members in DA who had shown interest in competitive cycling. 17 members including Dorothy Morrell and Iris James attended a meeting at the Bird in Hand, Saltford on January 4th 1928. Harry James, secretary of South Wales DA was elected Chairman. It was proposed by Fred Baker and seconded by Sid Gearing and Percy Stocker that it should be called the 'BRISTOL ROAD CLUB'. The club had two sections,' hard riders' and 'touring' members. Needless to say 'hard riders' were the racing section! 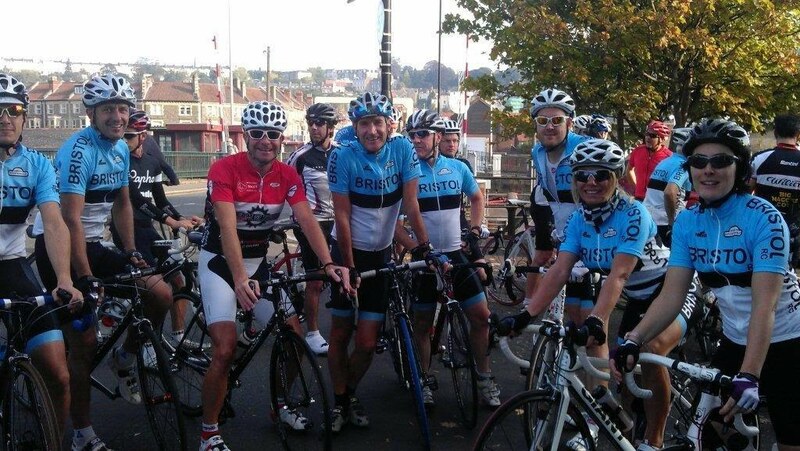 In the 1950's Bristol RC was Bristol's premiere racing and touring cycling club. During the 50's its clubroom was in Hengrove Lane, Knowle, adjacent to the old Bristol Speedway track, later at 149 Bath Road and later still in the Holy Nativity Church hall on the Wells Road Totterdown. If you require further information about the history of the club or would like to add any infomration you have about Bristol Road Club, past or present, please contact Graham Moore Click to Email or the webmaster, Brian O'Kelly Click to Email. We would very much like to hear from you. We still have an original Club rules handbook. Here are a few of the 18 pages! Bristol RC has 22 Trophies to be won for closed and open events. Graham Moore was a 3 times winner of Perfs Pedal, who became professional in 1972 for Ron Kitchin, then Raleigh and then Bantel. Also riders such as Stan Cesarz and Victor Nayduch and Clive Crossey (won Perfs Pedal after Graham). Richard Jarrold took over as Secretary in 1978 up to 2002 (24 yrs) and is longest serving Secretary in the club. Jim Grant is the current Treasurer. On 3 April 1988, Rod Seaman, Patrick Folley were Bristol RC club members in the Fire Brigade. Rod won the George medal and Patrick received the Queens Commendation for Bravery. Severn Bridge RR now uses the circuit that was originally the Severn-side RR run by Bristol South. There used to be a Juniors race called Henry Devauden RR, both then went over the Severn bridge twice, with the intention of climbing Star Hill, which organiser Jack Turner considered as a classic climb. He was a mentor and guru for young riders such as Graham Moore. Others to mention are: Pete Deamer, Steve Dunphy, John Pierce (now an internationally renowned cycling photographer covering many major tours). Bristol RC produced a monthly magazine in the 70’s edited and produced by John Pierce. Severn Bridge RR started off as an early season training race and first started in 1972 when it was organised by Jack Turner. Bohin and Solomon families were part of the club for 20 years following Jack Turner. Fred Baker, founder of Fred Baker cycles has past history with Bristol RC and was involved in its inception. BW Cycling of Bristol are the current sponsors of the Severn Bridge RR. Simon Hawkes won the National Junior Cyclo-cross title in 1975. Johnny Burrows was founding member, he married Iris James. For 60 years they were the backbone of the club, followed by Jack Turner and then the Bohin and Solomon families. Please send your Bristol RC stories and information to the webmaster so we can add to the club history. Click to Email the Webmaster.